Your donkey needs access to shelter from the elements, including rain, wind, cold, and heat. Donkeys typically do not like to be confined in stalls, but a 3-sided shelter is fine. Donkeys do not like to get wet. A donkey’s worst enemy is water and cold wind. If your donkey gets soaked and has to stand in a cold wind, he can get very ill. Your donkey requires unlimited access to fresh, clean water at all times. In the winter, he needs to have a water source that will not freeze. A de-icer will keep the water from freezing in even the middle of winter. Make sure that a de-icer is installed properly. Water and electricity can be a dangerous combination. Be sure the water is clean and free from debris. Donkeys don’t like to drink from green, algae infested water tanks. Your donkey needs annual vaccinations every year. Our donkeys receive rabies, VEWTT, and now West Nile Virus vaccinations every year. Donkeys also require regular deworming just like horses. 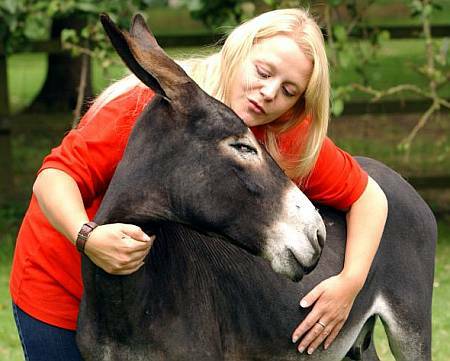 You should check your donkey regularly to make sure he doesn’t have any injuries or cuts that could become infected. Donkeys are very private about their pain. You might not know he is hurt until it gets really infected and may be too late to treat easily. Your donkey needs to have his hooves trimmed regularly as needed. Donkey hooves are very tough and hardy, but they still need regular care. Donkeys do not usually need shoes unless they have some sort of condition that requires corrective shoeing. If you live in a very dry and rocky area, you may not have to trim as often, as the hooves can be worn down naturally. Donkeys which live in wet areas are prone to getting thrush, which is a bacterial infection in the frog area of the hoof. Donkeys are very intelligent creatures. They are often labeled as being stubborn, but this is due to the fact that they carefully consider everything before they do it. You may want them to go up into a horse trailer. To them it may appear to be a huge monster with an open mouth, waiting to devour them. If you show the donkey there is nothing to fear, they usually comply with your wishes. Donkeys are very willing to please and will do pretty much whatever you ask, as long as you help them to understand that all is well and they have nothing to fear.